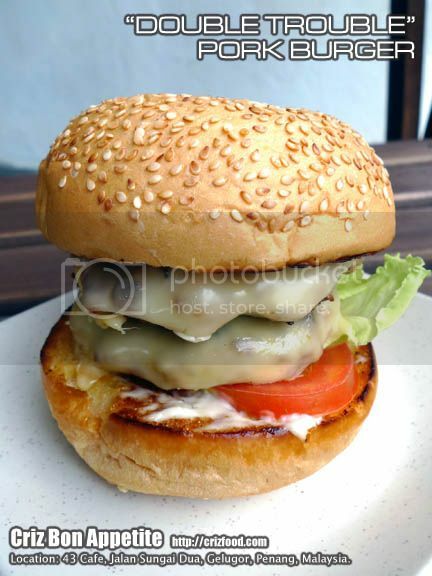 Pork Burger has been a booming business recently in Penang from night market (pasar malam) to posh cafes such as BeerBQ Bistro at Precinct 10, Tanjung Tokong, Penang. However, nothing would beat homemade ones which are tasty and economical. 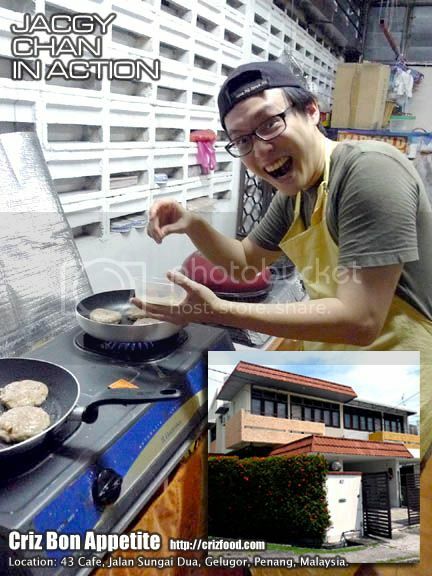 With the opening of 43 Café located along the main road of Jalan Sungai Dua, Penang, you would be able now to savor those succulent and flavorful pork burgers from as low as RM5.00nett each. Thanks to Mr. Jacgy Chan, who had brainstormed the idea of serving such heavenly treats, for the consumptions of the many pork lovers around Penang. The uniqueness of the Pork Burger served here, lies in the preparations as well as the cooking method used. 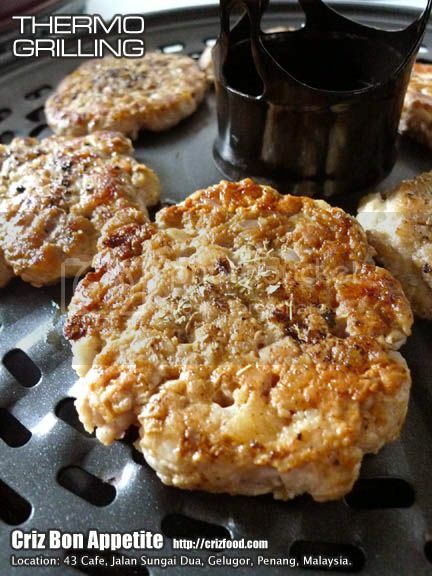 The pork patties were approximately 90gms in weight each and had selected minced choice meat with less fat, evenly combined with breadcrumbs, black pepper, mixed herbs and a light touch of seasoning. Moreover, it uses a special method of thermo grilling where barely any oil was needed and yet maintaining the flavors and moist within. Each patty would come with a slice of melted cheese. 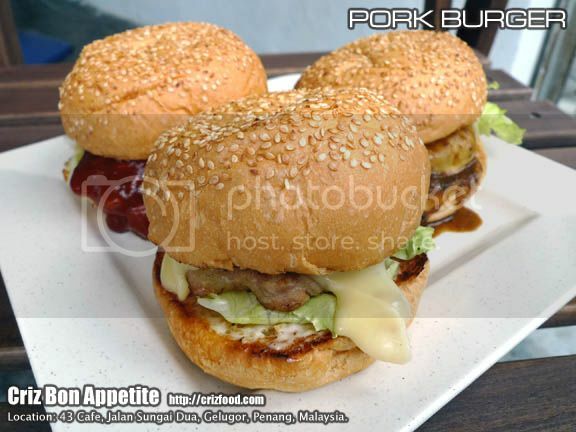 There are 3 selections of pork burgers served here, namely the Pork Burger with Cheese (Original – RM5.00nett, BBQ Sauce – RM5.50nett, Black Pepper Sauce – RM5.50nett). 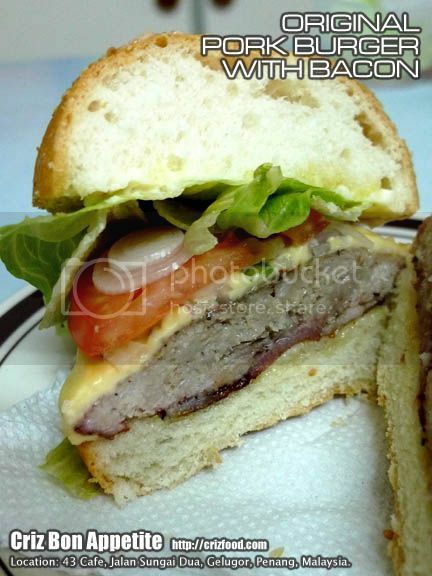 Each burger would have a butter toasted spongy bun with lots of sesame seeds, iceberg lettuce, tomato and onion on top of the beautifully prepared pork patty. Even without the sauce, the cheesy flavor from the melted cheese blended real well with everything. I personally love the BBQ Sauce more as it had that nice smoky flavors from the liquid smoke used. As I’m a spicy food taker, the Black Pepper Sauce was a bit mild but this sauce would be great for general intake, even for kids. If you feel that the bun were a bit too thick for your liking, you can always go for the Original Double Trouble Pork Burger (RM8.00nett). This set has a double boost of pork burger with cheese. I’m sure they would also serve triple patties upon request too. 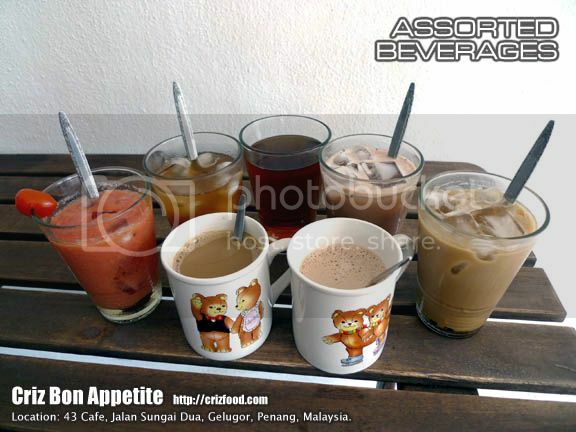 There are also other add-ons such as additional cheese (RM1.00nett/pc) and bacon (RM1.50nett/pc). I love the extra flavors on my Original Pork Burger with Bacon (RM6.50nett). Do keep a watch out on the sign board with special offers for the day. There could be some specially prepared dishes that are not stated in the menu or even package set meals available for the day. 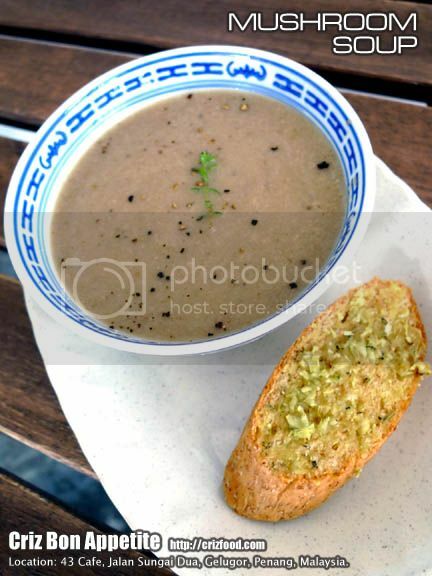 One of the dishes might be their home cooked Mushroom Soup (RM3.00nett) served with a slice of nicely toasted garlic bread. It had a combination of blended mushrooms in it with a light touch of herbs. 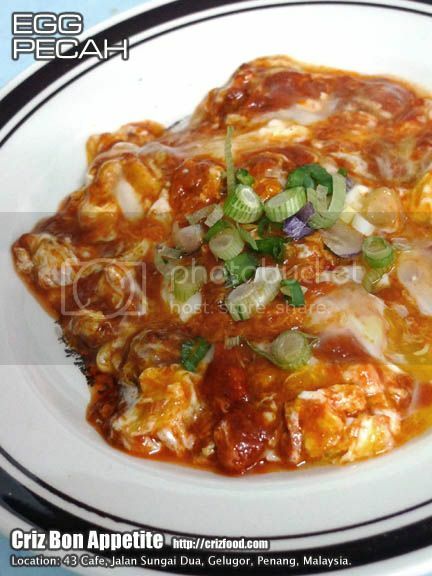 Other dishes might be their Egg Pecah (RM2.00nett) served with toasted bread/bun. This dish would have an egg stir fried in spicy chili paste in a semi raw presentation and garnished with some chopped spring onions. Occasionally, you would get to savor their freshly marinated chicken satay called Nom Nom Nom (RM1.00nett per skew with minimum order of 6 skews) served with some onions. 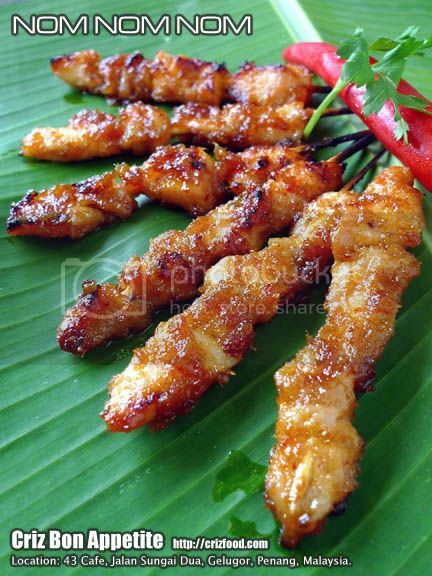 This dry version of satay without any dipping peanut sauce would be great enough for any appetite boosting as there would be the presence of sweetness, sourness and spiciness on each juicy skew. If your timing is right, there would be the Roasted Honey Chicken Wing (RM1.80/pc) available on that day. 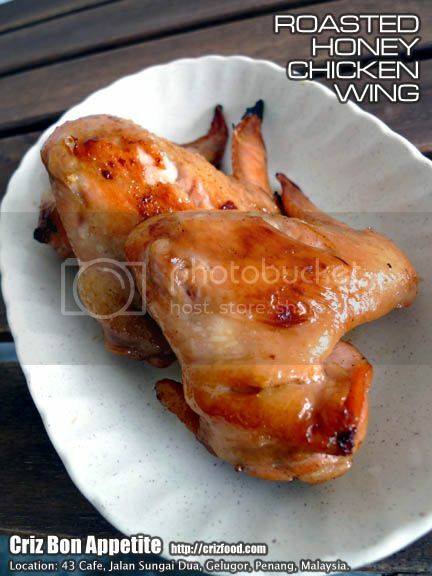 The wing had just the right marinates with light touch of sweetness from the coated honey. 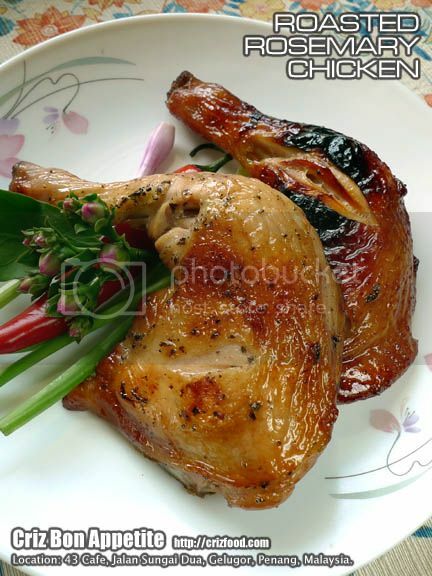 Another roasted version would be their Roasted Rosemary Chicken. The price has yet to be ascertained. As for desserts, there would be selected item daily ranging from homemade cakes, ice cream, jellies and more. One of the more notable ones would be their Homemade Peanut Paste (RM3.00nett). 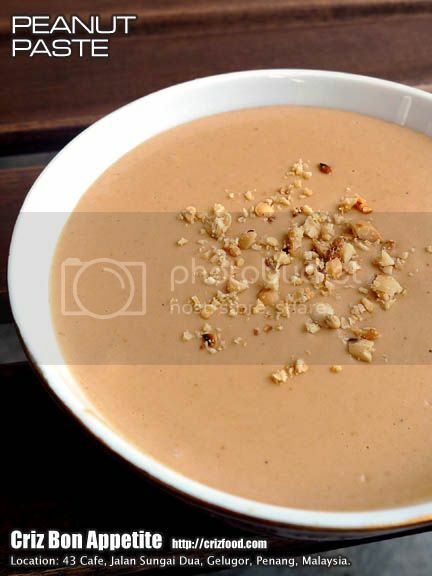 Each bowl would have freshly blended toasted peanuts with some chunky bits. 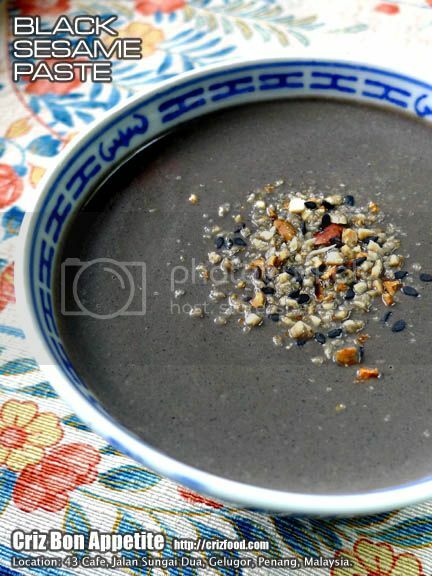 Another notable one would be their Homemade Black Sesame Paste which would be available from time to time. As for beverages, you should not miss out their freshly made Tomato Plum Juice (RM3.50nett). It had 100% fresh tomato juice blended in with sweet & sour plum and ice cubes with no added water or sugar. It’s a super healthy drink on a humid weather. Other drinks would include as the photo below. Chilled canned drinks such as Coca-Cola and 100Plus would also be available at RM2.50nett each whereas Chilled Mineral Water would be at RM1.50nett per bottle. 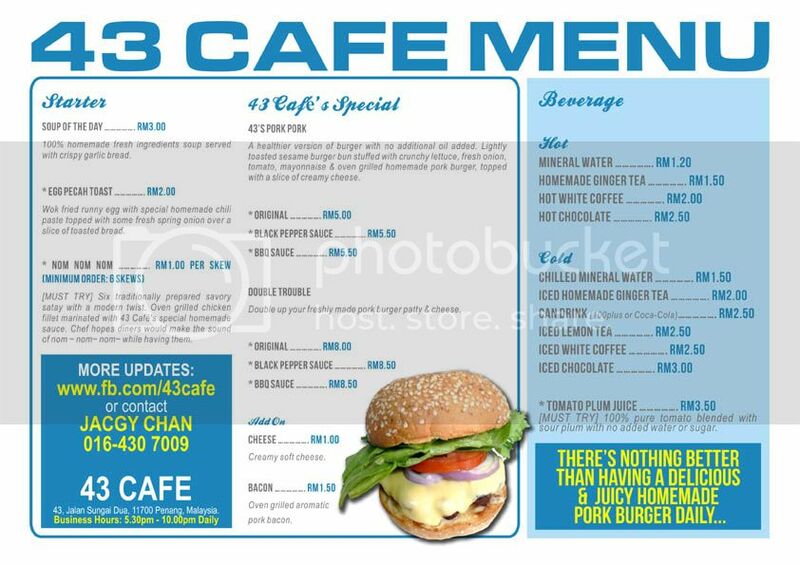 You can click on the photo below for a clearer view of 43 Café’s menu. 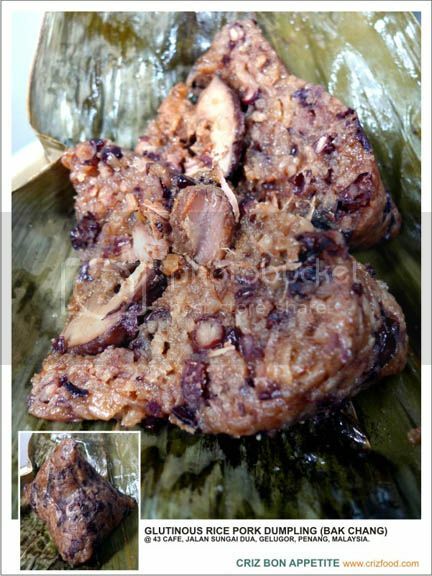 Presently, one of their hot selling items here would be their Homemade Glutinous Rice Pork Dumplings aka Bak Chang (RM5.00nett each). They are freshly made daily and only limited quantity would be available per day. Instead of the usual boiling in hot water for hours, these delicious dumplings would be steamed to bind in their rich flavors. Moreover, it has extra azuki beans added in for that nutty and aromatic texture. Other than the beans and rice, each dumpling would come with lean but tender choice pieces of pork, mushroom, dried shrimps, chestnut and specially ordered salted duck egg yolk. For glutinous rice lovers, this is one item you would not want to miss out. Overall, the café do keep to their reputation for serving cheap and good pork burgers. As for the rest of the dishes, there are still rooms for improvements for better taste and more varieties. The food served here basically caters for those university students or working personnel staying nearby that vicinity. 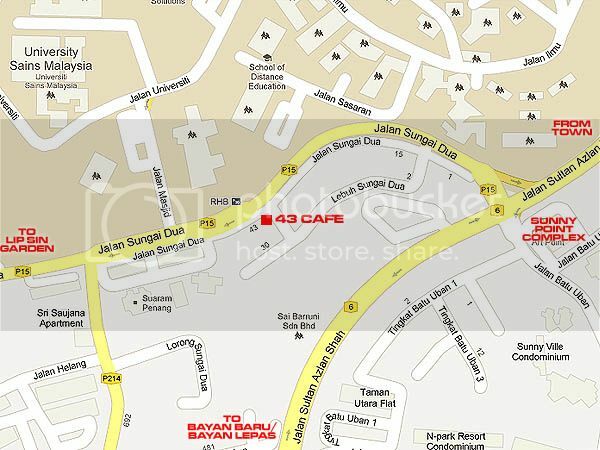 43 Cafe is located along Jalan Sungai Dua just opposite the Universiti Sains Malaysian, nearer to the Jalan Sungai Dua/Jalan Sultan Azlan Shah traffic lights (Sunny Point Complex). If you are coming from town via Jalan Sultan Azlan Shah, you would reach the traffic lights with Sunny Point Complex on your left. Turn right into Jalan Sungai Dua (USM main entrance) and keep to your left. About 100m away, turn left into the service road. Turn right and drive on for another 250m and you would see the corner unit double-storey house next to a photostating shop. That’s where the 43 Café is. There are ample parking spaces around the café. It’s funny you would ask me for landmark when the map, GPS, contact, instructions on how to use the map to go, are all mentioned in detail in my post. I must say that the food is so so and pretty much pricey. Service is slow and hardly no one there to attend the tables. I must admit that the service could be quite slow during certain days without enough manpower. As for the price, it’s quite standard for homemade meat patties.